Tropical flavors shine in this parfait that is so not ordinary. Refreshing fruit, Simple Grain-Free Granola with coconut and maple, dairy-free yogurt, and a little drizzle of honey are just what you need to help get you through this Back-To-School season. Because it is a “season”, isn’t it? Let’s be honest with ourselves. The anticipation, preparation, then, ultimately… shock-and-dive-right-back-in-there. Back-To-School is a season. So, we need easy, simple recipes like this grain-free granola where a little preparation in advance can save us during the busy week. Besides, HEY! You gluten-free, paleo, dairy-free souls out there! I am looking out for you with this recipe. So, let’s remake our same old parfait into an exciting and DELICIOUS new twist, shall we? This Simple Grain-Free Granola is loaded with all the good stuff. Walnuts, pecans, almonds, coconut, chia seeds, coconut oil, then sweetened with some raw sugar and MAPLE syrup. Love this combination of coconut and maple. Baking the Simple Grain-Free Granola is something you do want to watch while cooking. Like anything with nuts, we want everything well-browned, but not scorched. LOVE this mix of fruit! 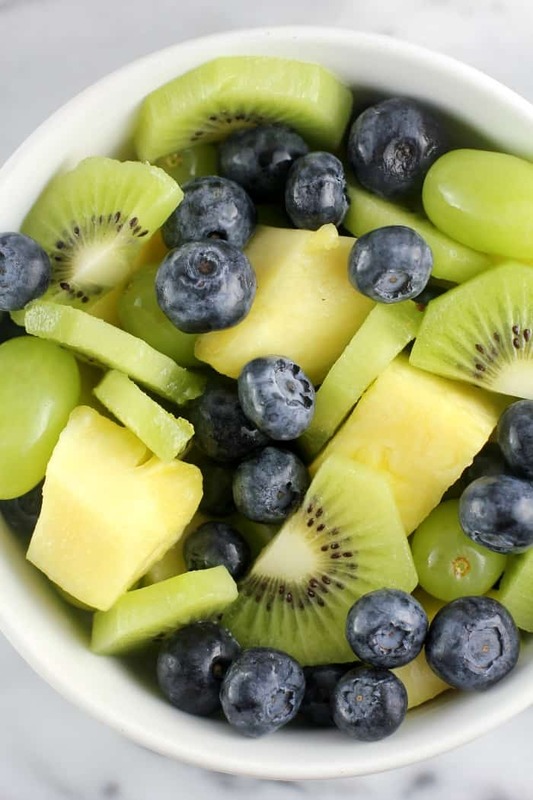 Kiwi, pineapple, blueberries, and green grapes. 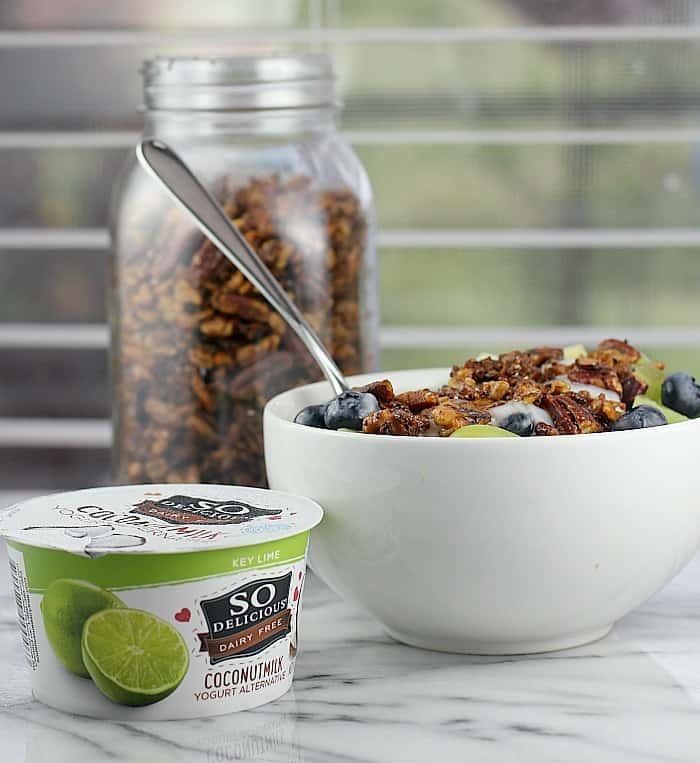 Simple, but a perfect combo to soak up all the Key Lime flavor from the So Delicious Dairy Free® Key Lime Yogurt Alternative. So one thing I did this summer was work on new ideas to help my life during the week, during the school year. I can’t count how many times I have set out to grandiosely prep on a Sunday literally everything for everyone for the week. But I’ve over done it or made stuff that wouldn’t last through Friday… too many fails. So I tried to come up with smarter ideas that would keep, and this recipe is one of those. The first trick is the grain-free granola. It is versatile, you can change it up however you want. AND it makes a good amount – enough to fill three 16-ounce Mason jars. Just store in the fridge and use as you like. The flavor is SO good – deeper and richer, not overly-sweet like store-bought granola can be. If you care about avoiding grains or gluten, they aren’t here. If you don’t care about that, you won’t even notice they aren’t here. Just awesome, maple crunch to top our Key Lime Parfait. 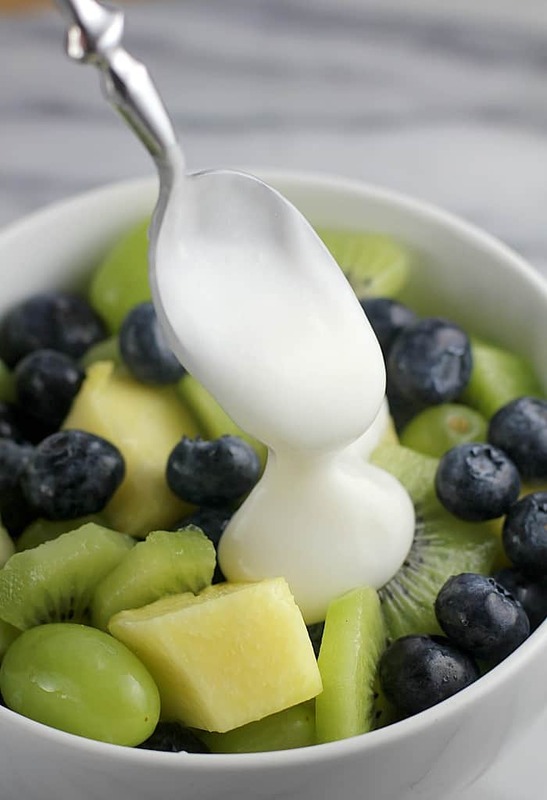 So let’s talk about the So Delicious Dairy Free® Key Lime Yogurt Alternative. Because all that thick, creamy, tangy-sweet, but not too sweet, Key Lime flavor is what makes this whole thing extra special too …and actually a Key Lime parfait. If you are wanting dairy-free, this coconut milk-based product also gives you your probiotics too. So Delicious has 9 other flavors available too, two with less than a gram of sugar and all non-GMO Project verified, certified gluten-free, and certified vegan. The Key Lime flavor is new so look for it at Walmart. Okay, so the way to do this as a meal-prep thing is ..this: Make the granola. Store the granola in jars or a ziploc bag in the fridge. Then, when you are in super-meal-prep mode, prep it up in a food container following the directions for the recipe if it is going to be eaten within a day or two. If prepping for longer, I keep the components separate in their own containers, then throw together when I’m ready to eat. 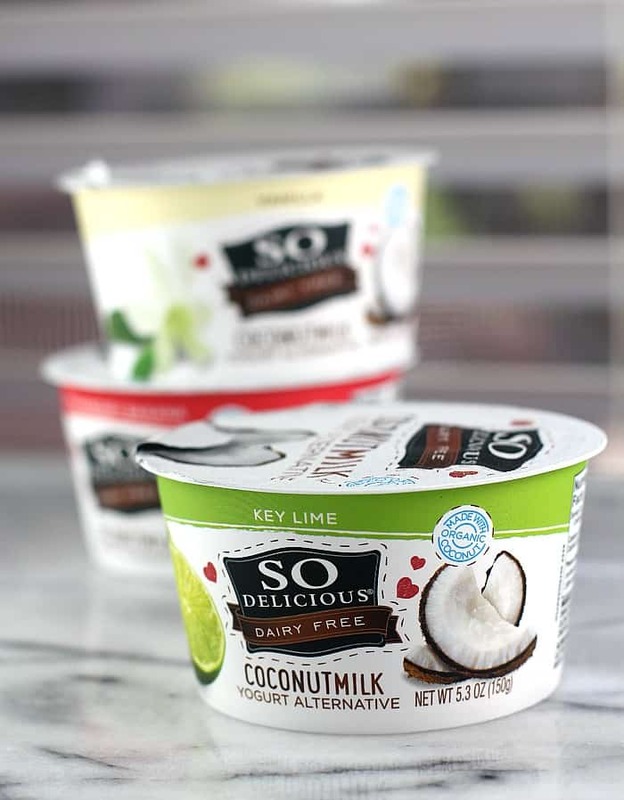 The So Delicious Dairy Free® Key Lime Yogurt Alternative can stay in their own handy containers until go-time. So that’s it folks! A yummy treat ..er, breakfast, to help us survive the busy Back-to-School times. Bursting with all the flavors, refreshing, crunchy, with just the right amount of sweet! Tropical flavors shine in this dairy-free parfait that is so not ordinary. 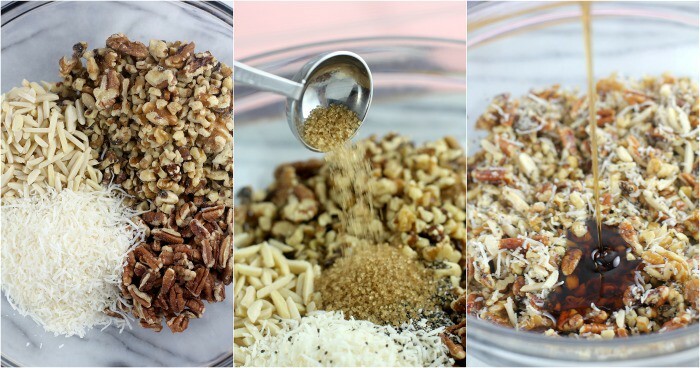 In a bowl, combine the granola ingredients in the order listed. Toss well to combine. Layer on a large, rimmed sheet pan. Bake at 325F for 20 minutes or until well browned. Let cool enough to handle, then transfer to storage container. Store in the refrigerator. To assemble a parfait: layer fruit, yogurt, and granola in a serving bowl. Drizzle with honey and serve. For more ideas visit the social hub! And leave me a comment! What tricks do you use to survive Back-To-School? 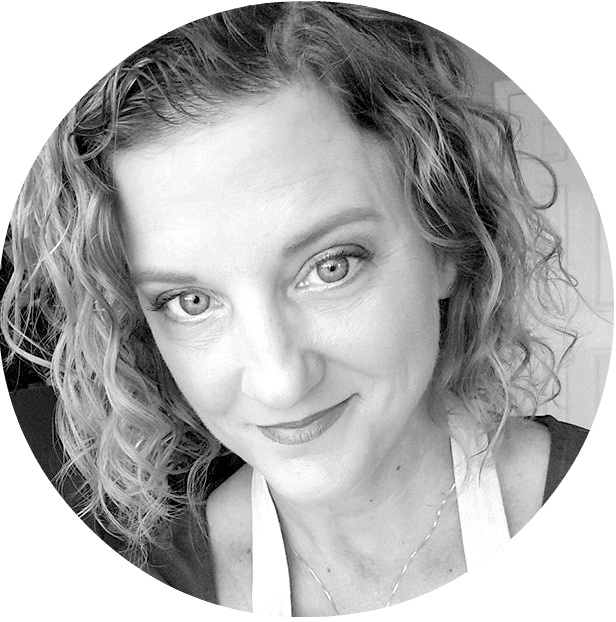 I recently tried the So Delicious dairy free yogurt and was beyond impressed. It was super creamy and delicious, almost like custard. I can not wait to use it in this tasty parfait! I drink this creamer, I need to try the yogurt. 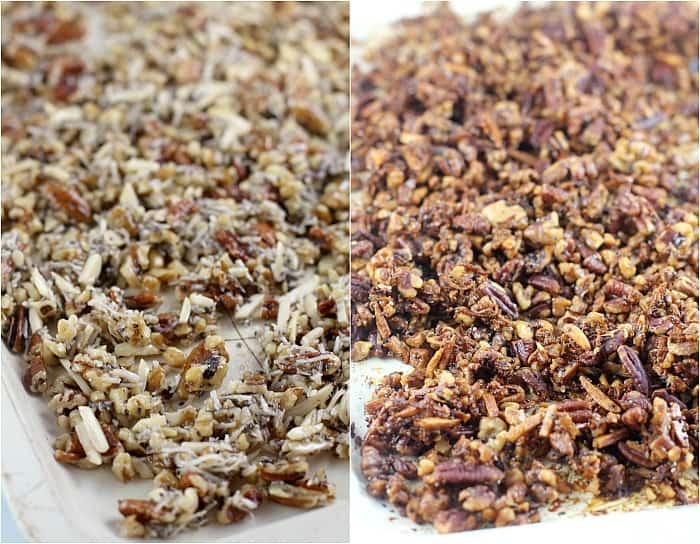 WE always love a little homemade granola, so much better than what you can buy. Back to school sort of came out of nowhere! Where did summer go? 🙂 This looks like a delightful product. 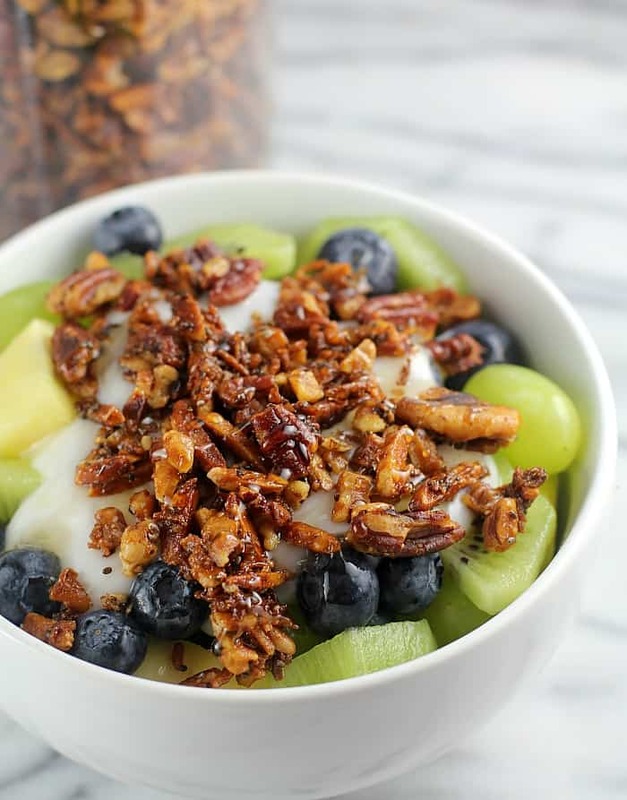 We’re big fans of granola and yogurt, can’t wait to try it out! I love a good parfait! They are so refreshing and perfect for breakfast. This looks delish! Oh I could totally go for a parfait like this! Awesome idea! I really need to try that yogurt alternative! Your parfait looks and sounds amazing! I love the addition of the crunchy granola! Yummers! Omg! 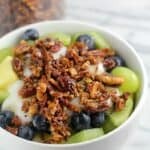 This looks amazing especially that granola! I would definitely enjoy eating this!